The story, briefly: I grew up in rural Australia, left my small hometown of Bathurst when I was 21, came to Atlanta, GA, USA, to study guitar, and here I am now. I play guitar, teach guitar, guide backpacking trips in Alaska, and sell photographs. Oddly enough, most of my time is spent on this darn computer trying to make all of that happen. Somehow it eats my time. I’m a passionate lover of nature and all things wild; more and more I feel most at home when I’m in the backcountry. Well, not so much when it’s raining and nasty out, but when the weather co-operates with me, there’s nothing quite like it. Photographing my experiences there has helped me to pay more attention, to see more deeply, to be more fully aware of the experience. I try to represent that experience in my images. A reverence for what is wild, for the primordial touches all of my photography – nature is intrinsically a part of us all, and I reach deep into that pocket for my inspiration. Working as a backpacking guide in backcountry Alaska is one the most positive experiences I’ve had, and I enjoy it immensely. Spending time in places like Wrangell-St. Elias National Park, Denali National Park and the Kenai Peninsula is its own reward, and I’ve gained so much from simply being there. 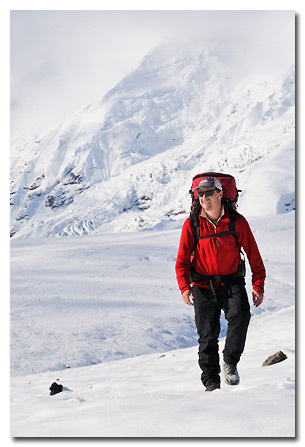 For details and a look at what I do, visit Expeditions Alaska. You can also see some of my images on that site, in the various Galleries. When I’m not in the backcountry, I look for place and time; images of the city, images of adventure and adventures, and images of people represent what the world is offering me at that given moment. I’ve had images published in magazines in the US and abroad, sold for commercial and political advertising campaigns, and also received awards in numerous competitions: in 2003 one of my images was awarded Slide of the Year by the Southeastern Photographic Society. I’ve also been a finalist in the National Wildlife Federation annual nature photography competition. I’ve concentrated much of my photography on the natural world, capturing images of landscapes, animals and birds, but with an ever-increasing and diversifying portfolio. All animal photos on this site are of wild animals, and none are digitally manipulated beyond standard sharpening, levels, and tonal adjustments, unless captioned otherwise. Skolai Images is named because of my love affair with a place informally known as “Skolai” (pronounced “skoal-eye””), high in the remote mountains of Alaska’s Wrangell-St. Elias National Park. It’s a place that simply drips grandeur, and I’m fortunate to spend as much time there as I do. Skolai Images represents my photography, and hosts a variety of images available for editorial, advertising or other commercial uses. I’m also available on a limited basis for assignment work. For more information regarding your photographic needs, please contact Skolai Images. Find me on Google +, Facebook, Twitter and Linked In. Thank you. — Carl Donohue.